I had surgery July 11, 2012. I weighed 246 pounds. This is August 25, 2013 and I have weighed 150 *for a couple of months now. I remembered that at the middle of October I weighed 190 pounds. So in three months I lost 50 pounds*. The weight just melted off all by itself. 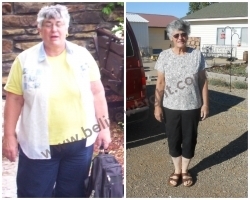 I had a friend that weighed over 300 almost 400 pounds and she lost 50 pounds in a month*. I did the gastric bypass. I wouldn’t recommend the lap band. I would recommend Dr. Umbach... He is fantastic. I thought about it for 4 years before I did it because I knew there were risks. I knew I wouldn’t be able to do it if I was still working. Some people can. I am so glad I did it. I am off all medication except the pill that slows my heart down for Afib. I still use my cpap for sleep apnea. If you are overweight with no quality of life, by all means do it. I went into surgery on Wednesday and was released by noon on Thursday. After you get through the first week, then you know what to eat or drink. Just sip liquids or very soft foods and lots of pop cycles and you will be fine. No meat until 18 weeks and I wouldn’t even do it then. Six months you will be able to eat everything, but now if I eat a hamburger, I tear off all the bread and eat the patty and other stuff. I use the bun to keep it together, but don’t eat any of it. This is a rare thing because I’d rather eat my fruits and vegetables. If I go out, I like the soup of the day the best. It breaks my heart now to see people that need it and are suffering with life. I just want to go up to them and hug them and say DO IT.